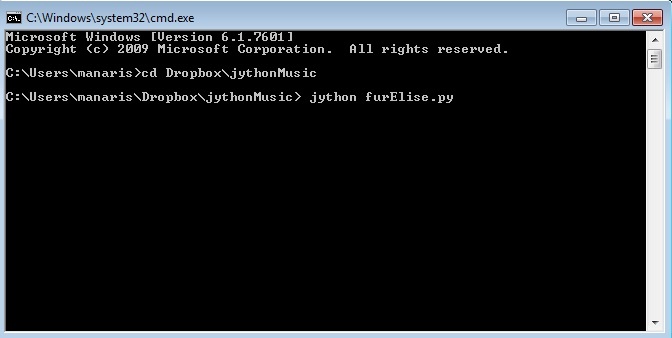 The Terminal Window is a lower-level way to run jythonMusic programs (Windows/Mac/Linux). Type “cmd” (without the quotes) and hit Return. This will open an MS-DOS window, as shown below. Change directory to your jythonMusic folder (e.g., type “cd DesktopjythonMusic” – or wherever your jythonMusic folder is stored). Type “jython -i filename.py“, where “filename.py” is the name of one of your programs. This will run the program and leave you inside the jython interpreter. To exit the jython interpreter, type “exit()“. Using the CMD window (Windows 7) to run a program. Click on the Spotlight search icon (top right). Type “Terminal” (without the quotes) and hit Return. This will open a Terminal window, as shown below. Change directory to your jythonMusic folder (e.g., type “cd Desktop/jythonMusic” – or wherever your jythonMusic folder is stored). Type “sh jython.sh -i filename.py“, where “filename.py” is the name of one of your programs. This will run the program and leave you inside the jython interpreter. Using the Terminal window (Mac OSX) to run a program. Open a shell window and follow the Mac steps 3, 4, and 5 above.